Lighting Ballast Control LLC v. Philips Elecs. North Am. Corp., 2013 U.S. App. LEXIS 9518 (Fed. Cir.) ‎(‎‎9/13/13). Whether the Federal Circuit should no longer provide de novo review of claim construction rulings. Line-Drawing-Problems between Issues of Fact and Issues of Law. The issue that was the focus of ‎much of the argument was whether a deferential standard was workable. Judge ‎Moore was troubled with the solution ‎offered ‎by ULT and the ‎PTO. She asked for a precise definition of a "historical fact" no less than three ‎times, ‎and never ‎received an answer that satisfied her. Because claim construction is ultimately an ‎effort to ‎decipher ‎the meaning that a person with ordinary skill in the art would ascribe to a claim term, she feared that ‎every ‎claim ‎construction decision (other than when the patentee acts as his own lexicographer) ‎would ‎be ‎considered a question of fact. Despite the PTO and appellee's repeated assurances ‎that ‎their ‎preferred level of deference would amount to no more than a "small change" in the law, ‎Judge ‎Moore ‎and others (including Judge Dyk, Lourie, and Reyna) seemed troubled by the ‎potential ‎implications of ‎the change. Judge Lourie asked whether every case would now involve ‎litigants ‎attempting to frame ‎legal determinations as factual determinations. ‎Given how disruptive the de novo review has been to patent litigation, I certainly hope that the Circuit ‎heightens its standard of review. But unless they come up with something clear, we know it can just ‎result in more litigation. When, during argument, the discussion turned to trying to find a way to ‎disentangle factual issues ‎from legal ones, Judge Dyk apparently commented "let's just experiment ‎and see how difficult it would ‎be. "‎ I assume that was made tongue-in-cheek. CLS Bank v. Alice Corp., (en banc)‎ 717 F.3d 1269 (Fed. Cir. 2013) (5/10/13). A 5-5 divided Federal Circuit punts. In a case that we all hoped might clear things up as to the patentability of computerized methods, the Federal Circuit en banc affirmed that the claims at issue did not constitute patentable subject matter. However, since the ten judges in the en banc panel issued seven different decisions, none of which was supported by a majority of the judges, the case provides little guidance. Seven of the ten agreed that the method and computer readable medium claims lacked subject matter eligibility. Eight of the ten judges felt that the claims should rise and fall together regardless of whether they were method, medium or system claims. The court divided 5-5 as to whether the computer system claims at issue were patent eligible. Alice Corp's claims are drawn to methods of reducing ‎settlement risk by effecting trades through a ‎supervisory institution ‎empowered to verify that both parties can fulfill ‎their obligations before allowing the exchange to be ‎completed. The court determined that this is an abstract ‎idea because it is a "disembodied" concept that is a ‎basic building block of human ingenuity, ‎untethered from any real-world application." Ultramercial Inc. v. Hulu L.L.C., 722 F.3d 1335 (Fed. Cir. 2013) (6/21/13).‎ The panel disagrees on the test but agrees that this method for distributing products over the Internet sets forth patentable subject matter. A month after deciding CLS, the Federal Circuit came down with its decision in Ultramercial. Here the court agreed 3-0 that the claims at issue to a "method for distribution of products over the Internet via a facilitator" did in fact constitute patentable subject matter. Therefore, the court held that the district court's dismissal of the case should be reversed. The panel, made up of Judges Rader, Lourie and O'Malley, of course vehemently disagreed on the appropriate tests on determining whether there was patentable subject matter. This case came to the Circuit in an unusual way in that the district court dismissed the case under Fed.R.Civ. P. 12(b)(6) because the claim did not recite patentable subject matter. The Federal Circuit reversed and remanded, and a petition for certiorari was filed. Shortly thereafter the Supreme Court decided Mayo, holding that steps of the medical diagnostic ‎method claims at issue failed to "add enough" to the "inventive ‎concept" of the asserted method ‎patents—the correlations between metabolite levels and ‎effectiveness of the drug.‎ The Supreme Court vacated the Federal Circuit's opinion and remanded the case. On remand, the Federal Circuit denied a motion for en banc hearing since it was in the process of considering CLS. Judge Rader had written the court's 2011 Ultramercial opinion so he authored the remanded decision as well. He started by noting that claim construction had not been conducted because the case was dismissed under 12(b)(6). While saying that the claims must be construed in the light most favorable to the plaintiff, he stated that a motion to dismiss should rarely be granted since claim construction often involves issues of fact, and we must always consider the presumption of validity. But he then concluded that construing every disputed term of every asserted claim was not a wise use of judicial resources, and he jumped right into a Section 101 discussion. Judge Lourie, in his concurring opinion, chastised the majority for applying its own Section 101 standards rather than following the Supreme Court's lead in Mayo and the plurality's views in CLS Bank. Petitions for Cert will be decided by the Supreme Court soon, as the oppositions to the petitions have now been filed. One big difference in the two cases is that Ultramercial (now sometimes referenced as Wild Tangent since that is the defendant who filed the petition) was decided on a motion to dismiss. Ultramercial might permit the Supreme Court to comment on when it may be appropriate to grant a motion to dismiss on the basis of patent ‎ineligibility. But it certainly is possible that both cases would be accepted. However, we can't assume any handling of these cases will clear the air. While the possibility of an evenly split Supreme Court is not likely to happen, we never know whether the Supreme Court is really going to examine the claims at issue or is just going to voice broad policy remarks that will be difficult to apply to particular cases. Accenture Global Servs., GmbH v. Guidewire Software, Inc., 728 F.3d 1336 (Fed. Cir.2013) (9/5/13).‎ Claims directed to a computer implemented system for handling insurance claims did ‎not recite patentable subject matter. In a 2-1 decision the Federal Circuit decided that Accenture's claims directed to a computer implemented system for handling insurance claim processing tasks did not recite patentable subject matter. The majority opinion, written by Judge Lourie, repeatedly cited to his opinion in CLS. Judge Rader, in dissent, voiced the same concerns he expressed in his dissent in CLS. The case simply demonstrates how the likelihood of success on appeal depends more on the panel that is drawn rather than the claims at issue. It shows the need for further guidance, which hopefully will come if CLS and/or Ultramercial are accepted by the Supreme Court, legislative changes are made, or new judges joining the Federal Circuit will change the balance in a noticeable way. Myriad obtained patents after discovering the precise location and sequence of the BRCA1 and BRCA2 genes, mutations of which can dramatically increase the risk of breast and ovarian cancer. This permitted Myriad to develop tests for detecting mutations for determining the risk of cancer. Myriad's patents covered the right to isolate an individual's BRCA1 and BRCA2 genes and to synthetically create BRCA composite DNA. The district court entered summary judgment, finding the patents invalid under 35 U.S.C. 101 because they covered products of nature. On remand following the Supreme Court's decision in Mayo, the Federal Circuit found both isolated DNA and composite DNA patent-eligible. The Supreme Court affirmed in part and reversed in part, noting that the case did not involve "method claims" for new applications of knowledge about the genes or the patentability of DNA in which the order of the naturally occurring nucleotides has been altered. Myriad's claims were not saved by the fact that isolating DNA from the human genome severs chemical bonds that bind gene molecules together. The claims were not expressed in terms of chemical composition, nor did they rely on the chemical changes resulting from the isolation of a particular DNA section. Composite DNA, however, was not found to be a product of nature since a lab technician unquestionably creates something new when introns are removed from a DNA sequence to make composite DNA. Shortly after Myriad was decided, the PTO announced it was changing the test for determining whether a patent application directed to DNA-related inventions are considered patentable subject matter. Medtronic Inc. v. Boston Scientific Corp., 2013 U.S. LEXIS 7390 (Supreme Court 2013) (10/15/13). ‎ Icon Health and Fitness Inc. v. Octane Fitness LLC, 496 Fed. Appx. 57 (Fed. Cir. 2012) (10/24/12). Highmark, Inc. v. Allcare Health Management Systems Inc., 687 F.3d 1300 (Fed. Cir. 2012)‎ (8/7/12). Leo Pharmaceutical Products, Ltd. v. Rea, 717 F.3d 1255 (Fed. Cir. 2013). ‎ Give sufficient weight to the objective indicia when evaluating obviousness. This is a pre-AIA decision examining the PTO's now-renamed Board of Patent Appeals and Interferences in an inter partes reexamination. Here the Board's decision on claim construction was reversed, but the decision is significant because of Judge Rader's extended discussion of how obviousness should be decided. In short, he held that the Board had given inadequate weight to the objective indicia of non-obviousness. The case is revealing in that it shows that the assessment of objective indicia of non-obviousness in a patent reexamination proceeding is the same is in the district court. This same rationale will of course apply to Post-Grant Reviews and other inter partes challenges provided by the AIA. In this case the patent claims a ‎‎storage stable and non-aqueous pharmaceutical composition used to treat skin ‎conditions such as ‎psoriasis. Prior to the invention, it was well known that a combination of Vitamin-D ‎along with a ‎corticosteroid could be an effective treatment. However, no one had been ‎able to ‎manufacture a storage stable form of the combination. This was challenging because ‎the ‎stable forms of the active ingredients prefer different pH levels. To achieve the storage stable ‎results, ‎Leo added a solvent to the mixture. The claim identifies the solvent in a Markush group that ‎includes thousands of potential compounds. Plantronics, Inc. v. Aliph, Inc., 724 F.3d 1343 (Fed. Cir. 2013) (7/31/13).‎ Be careful with your responses to requests for restriction. On summary judgment the district court found that a headset accused of infringing a utility patent was not infringed and that the patent in suit was invalid. The Federal Circuit reversed on both grounds, holding that an election did not in this case narrow the scope of coverage, and that the district court had not given adequate weight to the objective indicia of nonobviousness that supported patentability. During prosecution, the PTO issued a restriction requirement, and Plantronics elected to limit ‎the claim scope to claim species of ‎‎"Figures 1a and 1b." Those figures both show the headset stabilizer ‎support as an elongated member, while other non-elected species were structurally different ‎‎in that they did not include the elongated ‎member. The district court relied upon that the restriction/election ‎to construe "stabilizer support" as ‎an elongated member that is longer than it is wide. On appeal, the ‎Federal Circuit rejected that claim ‎scope narrowing because the reason for the restriction requirement ‎was not necessarily the elongated ‎structural difference. The opinion then turned to the objective indicia of nonobviousness, noting that commercial success, copying, or prior failures could weigh against a KSR-style ‎finding of common-‎sense motivation to combine.‎ While the district court apparently did consider the patentee's evidence regarding copying and commercial ‎success, the Circuit held that the district court's decision provided insufficient ‎written ‎analysis of the patentee's evidence. In addition the lower court ‎had mis-‎ordered its analysis by first finding a prima facie case of obviousness and then considering ‎whether the ‎objective factors negate that original conclusion. Rather, according to Circuit panel, the ‎objective ‎indicia of nonobviousness must be considered prior to reaching an obviousness conclusion.‎ Citing to In ‎re ‎Cyclobenzaprine Hydrochloride Extended-Release Capsule Patent Litig., 676 F.3d 1063, 1076 (Fed. ‎Cir. ‎‎2012), the significance of this fourth Graham factor cannot be overlooked or be relegated ‎to ‎‎"secondary status." In concluding, the Circuit held that it was not clear from the record that the district court had resolved all potential factual issues, such as the objective indicia, in favor of the non-moving party. Here that would have required that the objective indicia supported patentability. As such, the legal determination of obviousness did not appear to be sufficiently supported for a summary judgment determination of obviousness. ArcelorMittal France v. AK Steel Corp., 700 F.3d 1314 (Fed. Cir. 2012) (11/30/12).‎ Another case reversed for closer consideration of objective indicia. In this case the Federal Circuit panel reversed the district court's claim construction and remanded the case for a new trial. In so doing, the panel ordered the lower court to reconsider the jury instructions relating to commercial success. The district court's claim construction had been so narrow that the jury instruction made it difficult for Arcelor to establish a nexus between the sale of a number of its systems and commercial success that would support nonobviousness. When construction was broadened by the Circuit, the other systems now had to be considered as objective indicia supporting nonobviousness. It will be recalled that in KSR the Supreme Court ‎criticized the Federal Circuit's prior test that required that a "teaching, suggestion, or ‎motivation" to ‎combine be explicitly stated in the prior art.‎ ‎ As the Supreme Court said in KSR: "any need or problem known in the field of endeavor at the time ‎of ‎invention and addressed by the patent can provide a reason for combining the elements in ‎the ‎manner claimed." Soverain Software v. Newegg, 728 F.3d 1332 (Fed. Cir. 2013) (9/4/13). ‎ Summary judgment of validity reversed with a grant of summary judgment of obviousness. The patent in suit was directed to internet e-commerce in which computers were operated by a buyer, a merchant and a payment processor through a data network. Soverain sued seven online retailers, including Newegg. All of the defendants other than Newegg ‎settled by taking licenses under the patent.‎ Newegg argued that the claimed invention was obvious based upon a pre-internet system operated by Compuserve. This case is a little surprising in that in reviewing the district court's summary judgment ruling of non-obviousness, the Federal Circuit reversed and granted summary judgment of invalidity. In a unanimous opinion by Judge Newman, the court determined that there were no issues of fact that precluded summary judgment and after applying the prior art to the claims at issue, decided that all of the claims were invalid as obvious. This shows the risk one takes in moving for summary judgment and conceding that there are no genuine issues of material fact. The Circuit granted a rehearing of Soverain in September and confirmed that all of the claims at issue had been adequately and fairly assessed in the district court and on appeal. In so ruling, it also denied Soverain's motion for rehearing en banc. Transocean Offshore Deepwater Drilling, Inc. v. Maersk Contractors USA, Inc., 699 F.3d 1340 (Fed. Cir. 2012) (11/15/12).‎ "Transocean II" Patent found valid despite prima facie case of obviousness. Judge O'Malley, writing for the majority of the divided panel, distinguished the "advisory jury" option allowed under Fed.R.Civ.P. 39(c)(1) in which the jury's findings are not binding on the court. According to the court, Rule 39(c) is explicitly for use in an action not triable by jury. Smith & Nephew conceded as much, according to the court, by filing a Rule 50 JMOL motion in the lower court rather than filing a Rule 52(b) motion that would apply to an advisory jury action. This is one of several Rambus cases having been heard in recent years by the Federal Circuit. In response to a patent infringement suit, Nvidia Corp. requested inter partes reexamination. The matter was heard by the Board of Patent Appeals and Interferences, now the Patent Trial and Appeal Board. The BPAI agreed with the patent examiner's rejection of six claims held invalid for anticipation. The Board also agreed that those six and twelve other claims were invalid but that came only after the parties agreed that that the examiner had made an erroneous fact finding. Thus, the Board's obviousness determination differed from that of the examiner. However, a critical part of the case was that Rambus was not permitted to submit additional evidence to the Board even though the Board's findings were different from those of the examiner, and raised new issues that had not been a part of the proceeding before the examiner. The panel noted that while the BPAI can "elaborate on the examiner's findings" without offering ‎further ‎patentee argument, it must provide Rambus an opportunity to respond if its ‎rejection ‎relies on new facts and rationales not previously raised by the examiner.‎ The Board did not do so here so the court vacated the obviousness finding. MeadWestvaco Corp. v. Rexam Beauty & Closures, Inc., 2013 U.S. App. LEXIS 19657, (Fed. Cir.) (9/26/13‎). Alcon Research, Ltd. v. Apotex Inc., 687 F.3d 1362 (Fed. Cir. 2012) (8/8/12). ‎‎In a bench trial the district court held that eight of the asserted patent claims were invalid. The primary issue on appeal was whether there was a motivation to adapt the formula disclosed in the prior art (tested on guinea pigs) for use in treating humans. The panel held that the district court applied an overly strict "reason to modify" requirement to the claims setting forth a range overlapping the prior art. Given the district court's factual finding that guinea pig tests are generally predictive of a compound's activity in humans, the district court was held to have erred when it concluded that a person with skill in the art would not have been motivated to use the pertinent concentration with humans. With respect to the claims that did not recite ranges that overlapped with the prior art, the panel found no clear error for its conclusion that a person of ordinary skill would not have had a reasonable expectation of success for increasing the dosage into the range of the claims. The panel briefly discussed the objective indicia supporting nonobviousness but felt that the strong evidence of obviousness was not outweighed by the objective indicia. Versata v SAP, 717 F.3d 1255 (Fed. Cir. 2013) (5/1/13). A New Type of case for the Federal Circuit - Post-Grant Review. While we expect that the availability of Supplemental Examination may reduce the number of cases in which inequitable conduct is litigated, the cost for filing a supplemental examination request is steep, especially for large entities: $5,180 for the initial request plus $16,120 for the ex parte re-examination fee. Both must be paid at the time of initial request, although the $16,120 will be refunded if no re-examination is ordered in the supplemental examination certificate. It has been over two years since Therasense, and only two Federal Circuit cases have been uncovered that have affirmed rulings of unenforceability. I'll start with those two to show how difficult it is to have a patent found unenforceable due to inequitable conduct. Intellect Wireless, Inc. v. HTC Corp., 2013 U.S. App. LEXIS 20529, (Fed. Cir.) (10/9/13)‎. Filing of a false affidavit, without clear corrective action being taken after the falsity was discovered, meets the materiality prong of Therasense. ‎ In a case decided just last month, the filing of a false affidavit, without clear corrective action being taken after the falsity was discovered, was found sufficient to meet the materiality prong of Therasense. The panel further affirmed the district court's judgment as to the intent prong, again applying Rohm ‎& ‎Haas. "Submission of an affidavit containing fabricated examples of actual reduction to practice ‎in ‎order to overcome a prior art reference raises a strong inference of intent to deceive. "‎ The inventor had engaged in a pattern of deceit by claiming actual reduction ‎to ‎practice in other patent applications in the same family, and in using language in the two ‎declarations ‎that "dances around the truth." While this case was decided in early 2012 and not this year, it is illustrative of how the Circuit will affirm a finding of inequitable conduct in the appropriate case. In this case the same references that were withheld from the PTO were found to invalidate the claims at issue. Thus, the Court had no trouble finding the "but for" materiality element of Therasense satisfied. With respect to intent, the inventor argued that he did not appreciate the significance of the references and therefore the specific intent to deceive was not "the single most reasonable inference able to be drawn from the evidence." The district court found that the inventor cited prior art showing that others had recognized the problem with the prior art approaches but were not able to find the solution. Given that the withheld prior art showed the solution and the inventor clearly knew about the art, the district court determined that the intent to deceive was the single most reasonable inference. Relying on these materiality and intent findings, the district court found the patents were unenforceable due to inequitable conduct. Based on the evidence that was heard by the district court, and its thorough discussion of its factual findings, the panel found that the factual findings were not clearly erroneous and, based upon its well-reasoned analysis that was consistent with Therasense, the Circuit found that the district court's decision to strike down the patent as unenforceable was not an abuse of discretion. Network Signatures, Inc. v. State Farm Mut. Auto. Ins. Co., 2013 U.S. App. LEXIS 19499, (Fed. Cir.) (9/24/13‎). In this case the Federal Circuit reversed a finding of patent unenforceability for failing to tell the PTO ‎the reason for making a late maintenance fee payment, the majority of the panel holding that Therasense made it virtually impossible to meet in the context of a ‎maintenance fee payment since "substantive criteria of patentability" were not at issue. It is difficult to imagine a maintenance fee case in which the intent is more clear. It simply shows that the Federal Circuit, or at least this panel of the Circuit, is never going to find a patent unenforceable due to an intent to mislead in late payment of a maintenance fee. Powell v. Home Depot, 663 F.3d 1221 (Fed. Cir. 2011) (11/14/11). Here, the Federal Circuit affirmed a district court ‎determination ‎that the patentee did not commit inequitable conduct by failing to update a Petition to ‎Make Special as ‎this was "not the type of unequivocal act, 'such as the filing of an unmistakably false ‎affidavit,' that ‎would rise to the level of affirmative egregious misconduct.'" Outside the Box Innovations LLC (Union Rich) v. Travel Caddy, 695 F.3d 1285 (Fed. Cir. 2012)‎ (9/21/12). ‎Prior to Therasense, the Federal Circuit had held that inequitable conduct could arise when a ‎large ‎entity pays only the small entity fees. See Nilssen v. Osram Sylvania, Inc., 504 F.3d 1223, 1231-33 ‎‎(Fed. ‎Cir. 2007). In the present case the patentee paid the small entity fee when, based upon licensing affiliates, it should have paid ‎the ‎large entity fee. The district court held the patents unenforceable. ‎On ‎appeal, the Federal Circuit reversed, not on the ground of materiality, but on the basis of a lack ‎of ‎intent. Thus, the court did not decide the question of whether the false ‎statement ‎associated with the small entity fee payment could rise to the level of "affirmative ‎egregious ‎misconduct.,"
‎Writing in dissent, Judge Newman argued that the majority did not go far enough in its ‎reversal ‎because the filing of the small entity statement by affidavit should not render the incorrect ‎statement ‎‎"per se material." In re Rosuvastatin Calcium Patent Litigation, 703 F.3d 511, (Fed. Cir. 2012) (12/14/12). In his dissent Judge Mayer didn't clearly address the issue of the patentee's ‎deceptive intent, arguing that because the patentee deliberately drafted the patent claims and knew precisely the scope of the claims, there was no "error." While Judge Mayer stopped short of saying that the patentee had the requisite deceptive intent to ‎satisfy Therasense, he was highly critical of the patentee's actions, which he was ‎convinced would have constituted "fraud" under the pre-Therasense framework‎. Ibormeith IP, LLC v. Mercedes-Benz USA, LLC, 2013 U.S. App. LEXIS 21361 (Fed. Cir.) (10/22/13).Algorithm intended as structure to support a means-plus-function claim must ‎be specific. In this case Mercedes-Benz prevailed in defending against a patent infringement suit based ‎on ‎technology designed to detect when a motorist is getting tired because an algorithm intended as structure to support a means-plus-function claim must ‎do ‎more than list the relevant factors. Here the court found fatal the fact that the algorithm factors were not weighted or calculated. Section 112 (f) permits patent claims to be written as a "means for" accomplishing a particular ‎function. When written in claim form, a "means for" claim appears extremely broad ‎because it suggests coverage of all possible means or mechanisms for accomplishing the stated goal. ‎However, section 112(f) ‎requires that the limitation be construed to only cover the "corresponding structure … described in the ‎specification and equivalents thereof. Courts have repeatedly held that a patent is invalid as ‎indefinite if no particular corresponding structure for the "means" is ‎disclosed in the specification. See, e.g., Function Media, LLC v. Google, Inc., 708 F.3d 1310, 1319 (Fed. ‎Cir. 2013). ‎‎The patent claims at issue all include a "computational means" that determine whether or not ‎someone is sleepy. On summary judgment, the district court found the claims indefinite because ‎the claimed computational means were not supported by structure in the specification. Specifically, the specification did not disclose how the factors listed in the algorithm should be ‎weighted, or how specifically they are calculated in order to result in a warning being issued to the ‎driver. Writing for a unanimous panel Judge Taranto held: "Table 10 merely lists inputs without ‎specifying any single formula or function or algorithm defining the contribution of any of the inputs to ‎a computation. "‎ "A description of an algorithm that places no limitations on how values are calculated, ‎combined, or weighted is insufficient to make the bounds of the claim understandable. "‎ The issue of whether or not the disclosure was adequate is an issue of law decided de novo on appeal, but even under this lower standard of review the patentee was not able to prevail, and the court affirmed summary judgment of invalidity. In this case with a local flavor the Federal Circuit reversed a judgment of invalidity for indefiniteness of a patent on ‎an exercise equipment heart rate monitor based upon its holding that the functionality of a claimed device may adequately indicate the metes and bounds of ‎a limitation and render the claim not indefinite. Given all of the petitions for certiorari that are being filed these days in patent cases, it is unlikely that the case will be accepted but we can only wish our friends at the Klarquist firm good luck. nCUBE Corp. v. SeaChange Int'l., Inc., 2013 U.S. App. LEXIS 20614 (Fed. Cir.) (10/10/13‎). Motion for contempt denied even though design-around was not colorably different. Aevoe v. AE Tech, ‎727 F.3d 1375 (Fed. Cir. 2013) (8/29/13). ‎Preliminary injunction is appropriate, even as to a non-party. The district court subsequently modified its order to explicitly state that "colorable imitations" of the enjoined systems were also enjoined. At the time of the modified injunction Aevoe took the opportunity to add as defendants AE Tech's two suppliers, S&F and GreatShield. They were added to the injunction. AE Tech then filed a timely appeal to that modified injunction. Aria Diagnostics, Inc. v. Sequenom, Inc., 2012 U.S. App. LEXIS 20412 (Fed. Cir.) (8/9/13).‎ Denial of preliminary injunction is reversed. In this case the patentee filed a timely appeal of the denial of its motion for preliminary injunction related to its patent ‎on ‎detecting prenatal abnormalities.‎ The Federal Circuit reversed, holding that the district court was too hard on the patentee as to claim construction, patentable subject matter and in application of the four eBay factors. eBay Inc. v. MercExchange LLC, 547 U.S. 388 ‎‎(2006). Core Labs v. Spectrum Tracer Services, 2013 U.S. App. LEXIS 16285 (Fed. Cir.) (8/7/13). ‎Preliminary injunction relief can be easier in trade secret cases than patent cases. The Federal Circuit therefore reversed the district court and ordered that the preliminary injunction should be granted. Revision Military Inc. v. Balboa Manufacturing Co., 700 F.3d 524 (Fed. Cir. 2012) (11/27/12). Denial of preliminary injunction is reversed because court improperly applied Second Circuit heightened standard. LaserDynamics v. Quanta Computer, Inc., 694 F.3d 51 (Fed. Cir. 2012) (9/14/12).‎ Jury award overturned due to improper application of Entire Market Value rule. Here the court overturned an $8.5 million jury award, discussing ‎in ‎detail the level of evidence needed to support the use of the entire market value (EMV) rule where an ‎individual ‎component of a computer was accused of infringement. The Federal Circuit held that ‎application of ‎the EMV rule could not be justified simply by asserting a low enough royalty rate. It ‎was also not ‎enough to show that the patented component was valuable, important, or even essential ‎to the ‎entire system, or that given a choice, customers would choose the system with the patented ‎feature. ‎Instead, the patent holder had to demonstrate that customers bought the entire system ‎because of ‎the patented component alone. The court continued its discussion that may articulate a new ‎rule ‎for determining reasonable royalty patent infringement damages on multi-component or multi-‎‎feature products. "Where small elements of multi-component products are accused of infringement," it ‎is ‎‎"generally required that royalties be based not on the entire product, but instead on the ‎smallest ‎salable patent-practicing unit." 694 F.3d at 67. "Where small elements of multi-component products are ‎accused of infringement, calculating a royalty ‎on the entire product carries a considerable risk that the ‎patentee will be improperly compensated for ‎non-infringing components of that product‎." Id. "We reaffirm that in any case involving multi-component products, patentees ‎may ‎not calculate damages based on sales of the entire product, as opposed to the smallest salable ‎patent-‎practicing unit, without showing that the demand for the entire product is attributable to the ‎patented ‎feature." Id. at 68-69‎. Versata Software, Inc. v. SAP America, Inc‎., ‎106 U.S.P.Q.2d 1649 (Fed. Cir. 2013) (‎‎5/3/13)‎. The Circuit continues its discussion of the Entire Market Value rule. The Circuit affirmed an $85 million royalty award despite the defendant's argument that the EMV rule was improperly applied. The panel held that the EMV rule simply didn't apply here. WhitServe LLC v. Computer Packages Inc., 694 F.3d 10 (Fed. Cir. 2012) (8/7/12).‎ Expert testimony must be specific and provide a complete basis for an opinion. The district court found that post-verdict continuing infringement had been willful even though the patentee did not claim willfulness at trial. The enhanced damages award was found by the Federal Circuit to be appropriate, affirming an award of $95 million, over $5 million in supplemental damages and almost $12 million in enhanced damages against nine foreign firms that make power converters incorporated into computing and telecommunications equipment overseas and are shipped to the U.S.
As to the enhanced damages, the district court had found egregious conduct "in continuing, and ‎even ‎increasing, sales in the face of an infringement verdict," and had multiplied the damages ‎attributed to ‎post-verdict sales by a factor of 1.75.‎ The panel found that this enhancement was proper under 35 U.S.C. §284. In re Owens, Fed. Cir., 710 F.3d 1362, (Fed. Cir. 2013) (3/26/13‎). ‎ Use of different boundary lines might constitute new matter in design patent application. 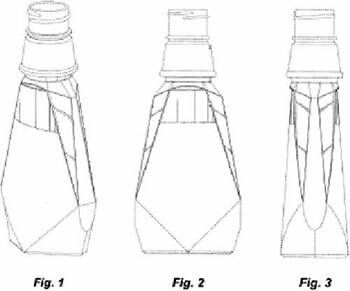 The Federal Circuit affirmed a rejection of a continuation application for a design patent ‎because the new application's use of unclaimed boundary lines appears to create a trapezoidal-shaped ‎surface that was not in the original patent application. High Point Design LLC v. Buyer's Direct, Inc., 2013 U.S. App. LEXIS 18836 (Fed. Cir.) (9/11/13). Summary judgment of invalidity of design patent reversed due to improper obviousness analysis. The unanimous panel, for whom Judge Schall was writing, first dealt with the issue of obviousness. 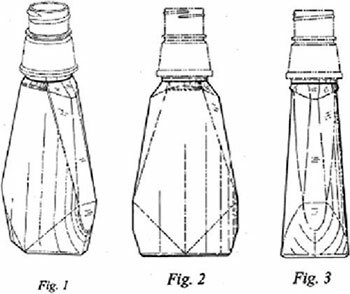 According to Judge Schall, in the design patent ‎context, the § 103 analysis has two steps. First, the court must identify a proper primary reference—‎i.e., a "something in existence" that has "basically the same" appearance as the claimed design. ‎Then, assuming certain conditions are met, other references can be used to modify the primary ‎reference "to create a design that has the same overall visual appearance of the claimed design." ‎If this test is satisfied, then the patent should be considered obvious and invalid.